Belle the 36" Leclerc Nilus and I have been having ongoing issues with brake slippage. The new brake cable has been working great, but there is a part of the brake drum that must be smoother than the rest and whenever it was in a certain position, the cable slipped while I was weaving. In all other positions, it held fast. While not a deal breaker, it was annoying, as I had to release the brake and the cloth advance ratchets, roll the front beam back to give more slack to the warp threads, get up, wind the warp back on the back beam, then sit down, engage the brake, and tighten up the warp again. Ordinarily, I should only have to release the brake and advance the cloth beam without moving. 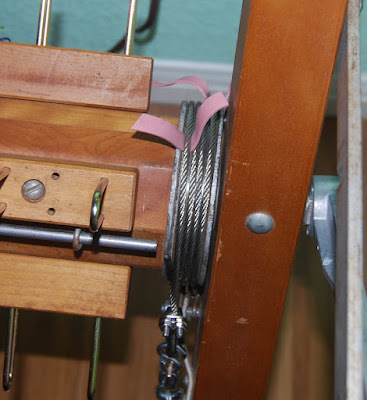 I was able to weave on Belle, but as soon as I hit that smooth part on the brake drum and had to do all of the above, I would stop and find something else to do. Since Belle came home in April, I have noticed, at least, half a dozen posts on the various Facebook weaving groups about Leclerc brake issues. The most common problem was slipping. In the comments to one of the posts, a lady said she simply ran a piece of rubber band under the brake circle and Voila! Problem solved. I do not remember what post the comment was attached to or the name of the lady who offered the solution, but I tried it, and Voila! Problem solved. 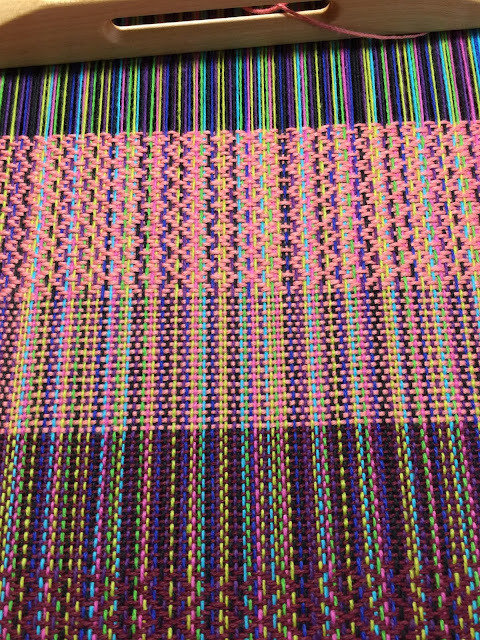 It works so well, I have spent the last two hours straight weaving on the lovely Belle! She is now an absolute joy! 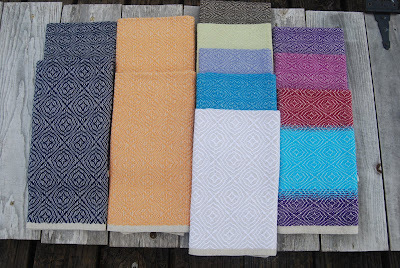 These are just tea towels. I finished the one below with dark burgundy 8/2 cotton weft. 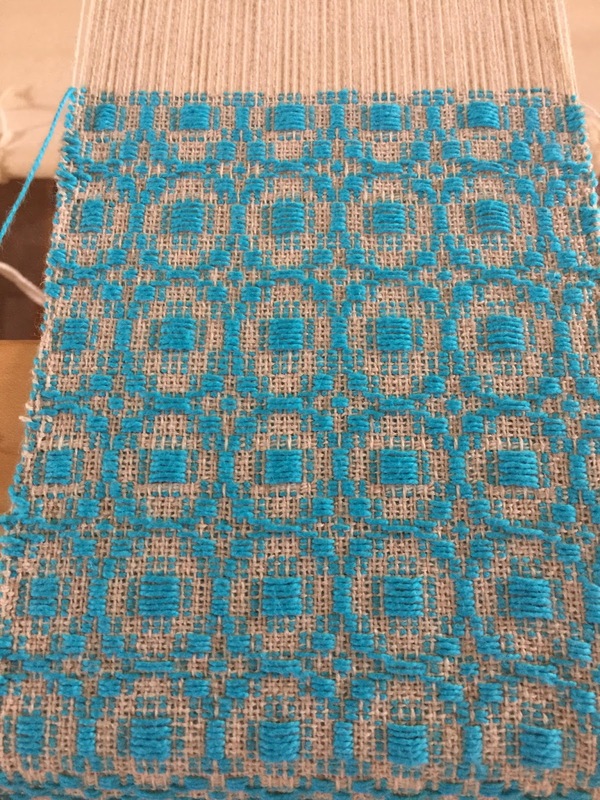 The one above uses a lighter color in 8/4 cotton warp as weft. 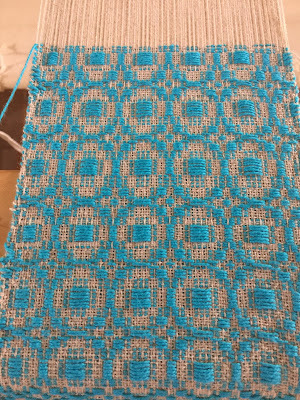 The weft is 8/2 cotton, as well. I am just playing with different pointed twill patterns and wefts. So, the soundtrack for this particular post is Rubberband Man. In other news, some friends visited with us in May. She is the one who bought the Schacht 25" 8-shaft table loom from me a year or two ago and took it back with her to Saudi Arabia where she and her husband are living at the moment. Once her husband retires, they will be building a home in the Texas Hill Country not far from us. She has been enamored of my Macomber loom, and her husband has had me secretly on a search for one for her. 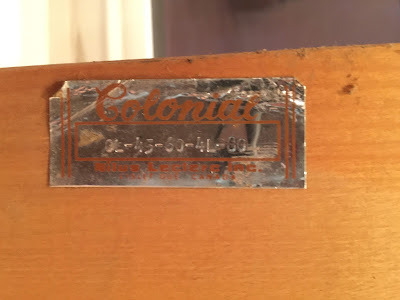 While I did not come across a Macomber for her, I did see a really well priced Leclerc Colonial 60" 8-shaft loom in Princeton, New Jersey for sale. I spoke to the husband and told him it was a great price, we would just have to figure out how to ship it down here. 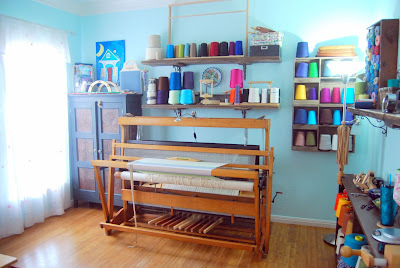 As the Woolery and Webs offer free shipping when buying a loom and, at least, one other place charged $300 to ship a new loom, I did not think that shipping would be all that expensive. In my mind, the biggest problem would be to find someone willing to box or crate it up for shipping. We contacted the seller. He said it was his wife's loom and about 12 years old. He said she originally had three or four looms, but this was the biggest and last one they had, as she no longer weaved. 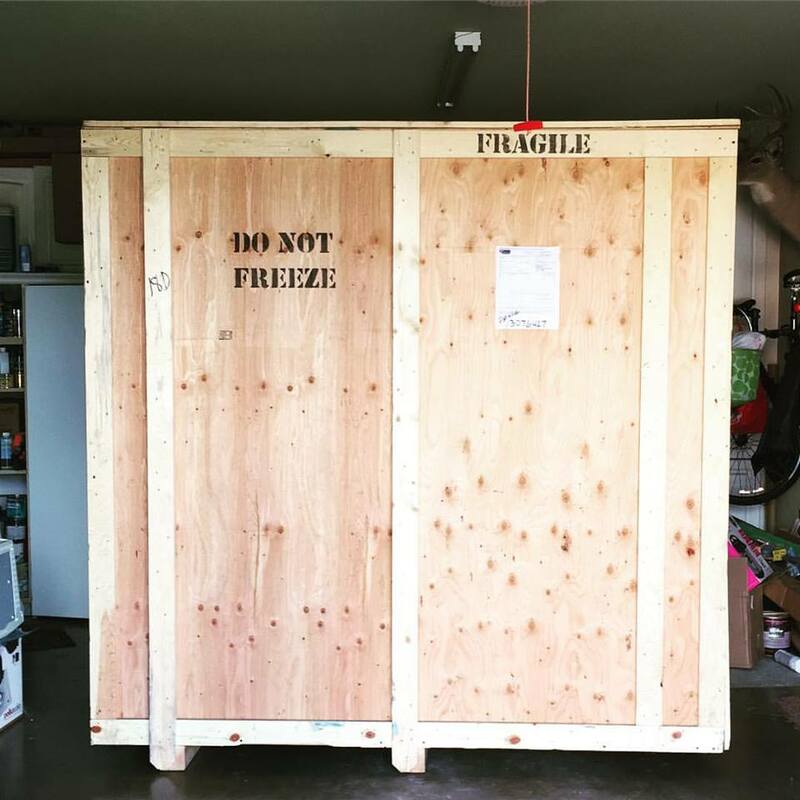 He indicated they had had it professionally disassembled and all of the pieces were in his garage. For the purchase price, they would also throw in a bench, spool rack, and some other accessories. Rather than a complete surprise, I suggested the husband may want to discuss with his wife, as looms are kind of personal. I thought it might be too big for what she had in mind. She was shocked when he brought it up, but she was excited and all in. Thereafter, the husband and I began looking at different shipping options. In addition to contacting a friend in Manahawken, New Jersey to see if she knew anyone who would be willing to pick up the parts and pack them for us, I contact a local mover. My New Jersey friend did not know anyone who owned a truck. Without a truck, it would not be possible to collect the loom. But she tried, and I really appreciated her help on my unusual request. 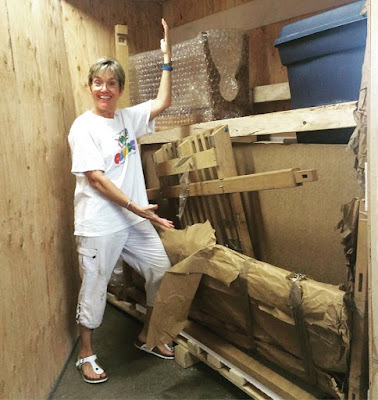 The mover was more than willing to pick, crate it, and add it to a load destined for Texas, but the price she quoted was twice the cost of the loom. No bueno. Fortunately, the husband had some contacts and was able to get it all taken care of and had it shipped directly to my house for a very, very good price!! On Wednesday of last week, it arrived. To say it was MUCH BIGGER than what I anticipated is an understatement. On Thursday afternoon, my friend arrived, and my husband was smart enough to figure out how to get into the crate. Truly, I walked around it half a dozen times and had no idea how we were going to get into it. I was a also little concerned we might find something like a stuffed lion in there, instead of a loom, but we had a loom! As you can see, my friend was just as thrilled as I was to see it! 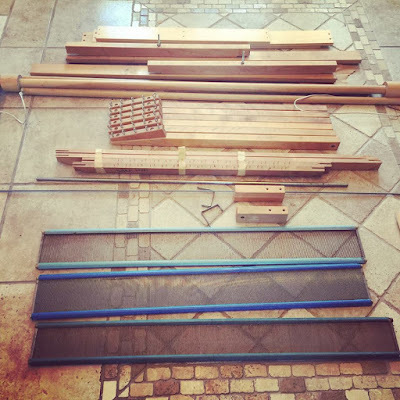 While I worked on Friday, she set about the tedious task of unpacking all of the parts, wiping them down with a mixture of vinegar and water, as it was obvious this loom had been stored for quite a while, and laying them out for identification. 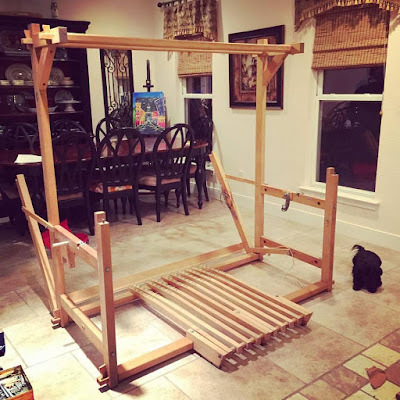 However, by the time we retired to bed Friday night, the loom had begun to take shape. By early Saturday afternoon, we had a fully functional and working loom! 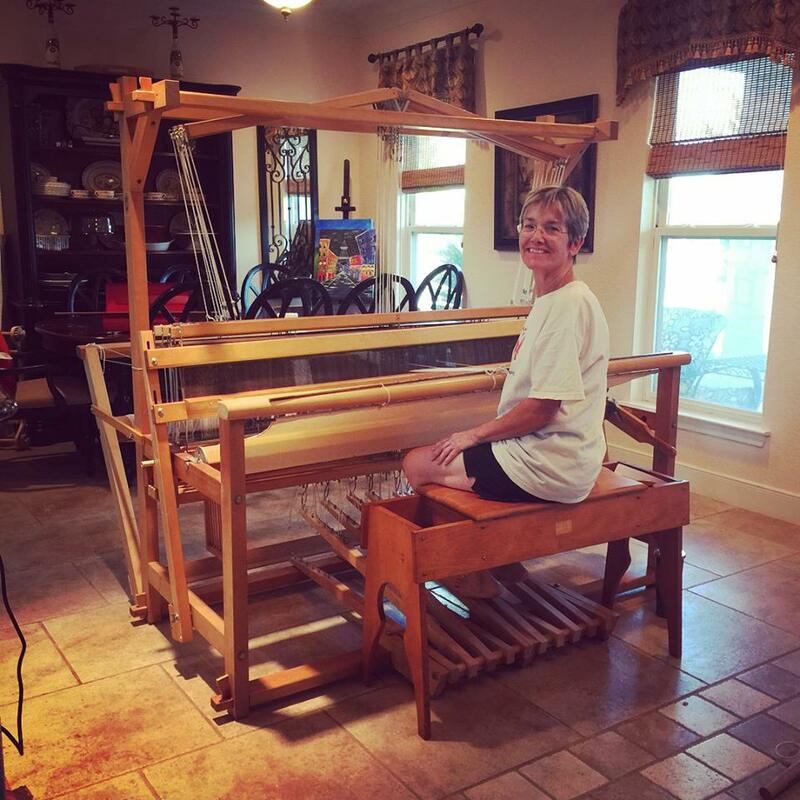 We also had one very proud and happy new loom owner. 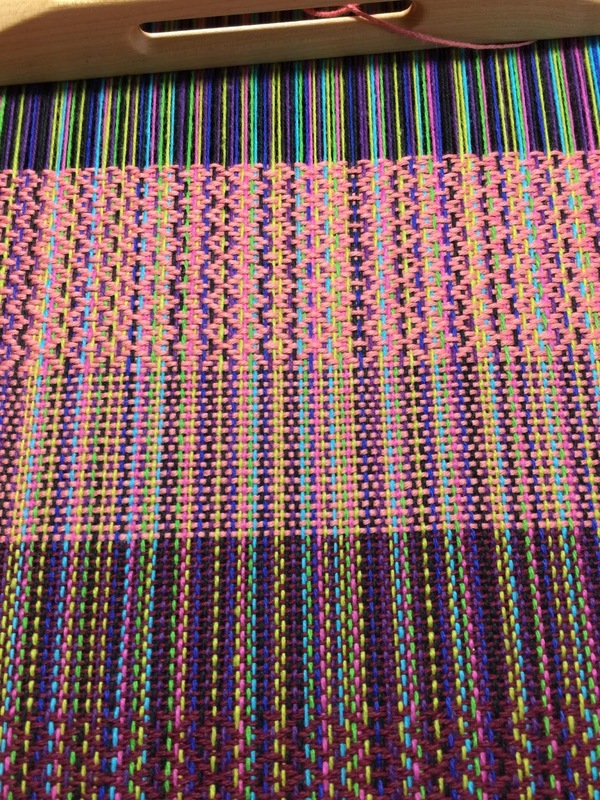 We were also able to put on a very narrow warp and introduce my friend to overshot weaving on her new loom! There were only a couple of hiccups with the assembly. I did not happen to have an extra one on standby, either. 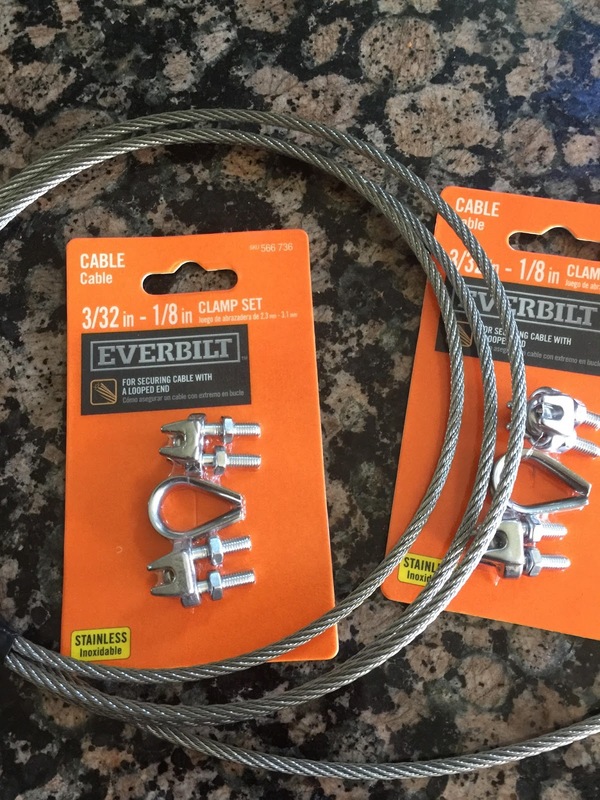 However, the husband was able to make a cable brake from 1/8" non-coated steel cable and cable fasteners. At Home Depot, the cable is $.32/foot, and I bought 9 feet. The fasteners were less than $5 each. So, for less than $13, we had a fully operational tension brake! Based on its serial number, this loom was a lot older than twelve years. While hard to read, I believe this loom was built in 1980. 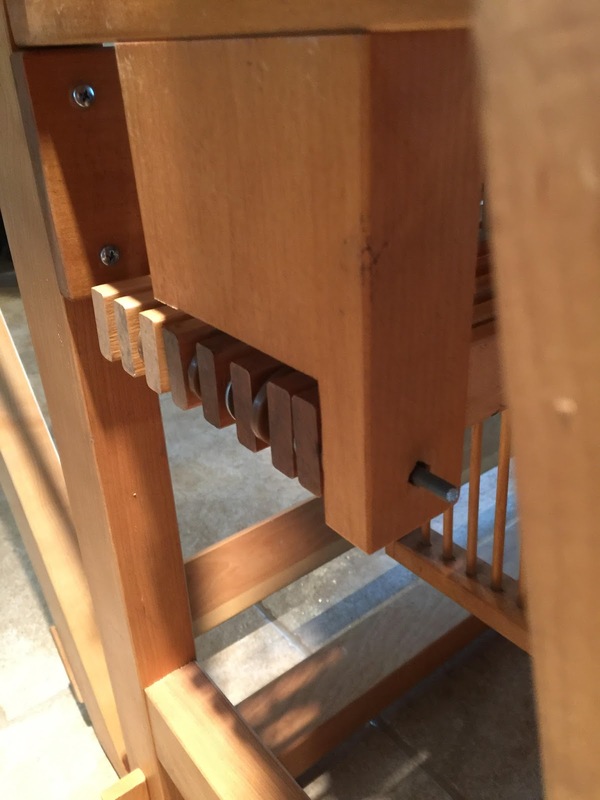 It was also originally a 4 harness loom with another 4 harnesses added later because there was a box, which held one end of the lams on the left side of the loom that only had room for four. The lam housing was intact and had not been completely disassembled. The first four lams had a bolt through one end, and the second four lams had a separate bolt through them, as well. Unfortunately, there was nothing to stabilize the pivot point on these lams. This interfered with separate lams rising one at a time. 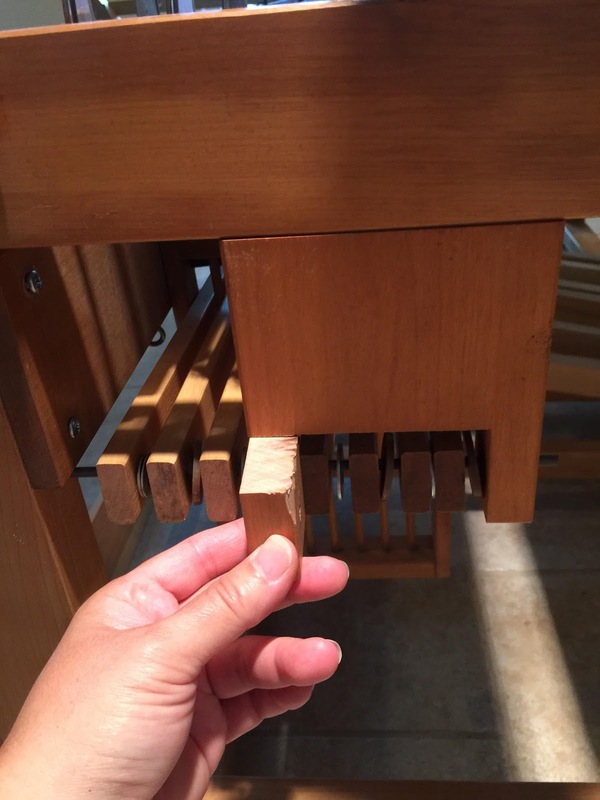 With my friend's permission, as it was her loom, I asked the husband to modify the box, which housed the original four lams. I asked him to cut one end off, so all eight could be secured with a metal rod. He agreed. In addition to taking one part of the box off, he drilled a hole in the castle to secure one end of the rod, to hold everything in place. 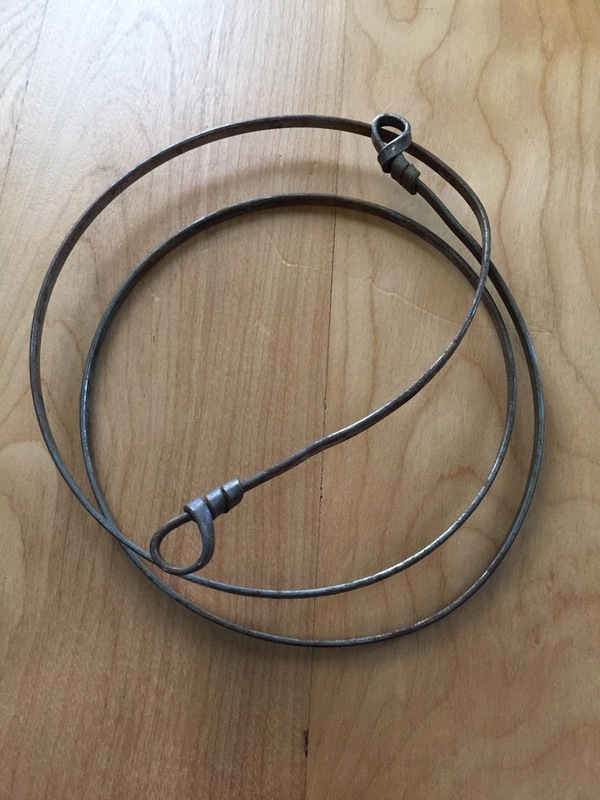 He fashioned the rod out of an extra steel rod that was too short to be used as a warp rod. Here is the box with one piece removed, which is being held up to show where it once was. Here is the final result! I am actually quite proud of this solution, especially, as the 46 pages of instructions did not address any of it. There were some springs, which had been hanging on the back of the loom. Other than a brake spring, none of the looms I have or have ever had used any other springs. We were having difficulty getting a clean shed, when my friend returned to the instructions and determined they needed to be attached to the treadles. She and my husband had bought several at the local hardware store. Once they were installed, we had lovely clean sheds!! The seller has been contacted, and we are awaiting word from him on what he would like to do with these pieces. If he does not want them shipped back to him, I anticipate I will offer them in the Facebook groups for the cost of shipping them to their new homes. We shall see. In all, the last week has seen quite a bit of weaving and loom-related activities! I am so thankful my husband is handy and willing.